The Su-27KUB has a larger wing area, canards, ventral fins, rudders and horizontal stabilisers. These changes enable lower approach speeds and a smoother and thus safer landing. The nose section has considerably been modified to fit the side-by-side cockpit, but retains the circular nose (unlike the Su-27IB). The pilots enter the cockpit via the nosewheel bay. The IRST is, unlike on the Su-27K, centered in front of the cockpit and the IFR probe is placed on the port side just below the canopy. The gear, air intakes, fins, hook, etcetera remained the same as on the Su-27K. The maiden flight, first carrier landing and take off all took place in 1999. In the following years, the Su-33UB has succesfully completed testing and certification, which enables the type to enter series production. Until recently the Su-33 future seemed to be limited to the Russian Navy's fleet of 24 Su-33s operating from its sole aircraft carrier Kuznetsov. Although it plans to have two new aircraft carriers by 2017, at the same time it was revealed a new multi-purpose fighter would be developed to equip them. However in late 2006 it was revealed by Russian newspaper Kommersant that Russian State arms export agency Rosoboronexport had entered negotiations with China for the sale for up to 50 Su-33 naval fighters in a deal worth up to $2.5 billion. An initial fleet of 12 aircraft would be operated from the former Soviet aircraft carrier Varyag, which China acquired from the Ukraine in 1999 and is currently being refitted at the Dalian shipyard. The deal was expected to include an initial $100 million order for two KnAAPO produced aircraft for trials. Additionally China sought to procure 12 aircraft to equip its first carrier. However in March 2009, the Moskovsky Komsomolets newspaper reported that negotiations on the deal had collapsed recently over fears that Beijing could produce cheaper export versions of the aircraft with Chinese avionics and systems, in similar fashion to the J-11B. Additionally Russia was reportedly seeking to secure an order for at least 24 aircraft to recoup production costs. Despite this latest report, China is unlikely to be able to fulfill its requirement for a carrier capable fighter in the near future, even though more expensive Western alternatives are theoretically available. In addition to the Varyag, China plans to deploy a fleet of three indigenously developed carriers in 2016. Although Chinese plans include the development of its own naval fighter to equip them, it will take some time to develop it as it currently owns no other carrier capable fighters. In this light it is possible that negotiations for the Su-33 will be resumed at a latter stage, if China abandons its plans to export the J-11B. 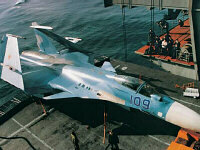 RIA Novosti (10/03/2009), Russian-Chinese Su-33 fighter deal collapses - paper, http://en.rian.ru, Moscow, 10 March 2009.